Posted on August 20, 2018 by Greg Kaz. There is no shortage of options available when it comes to roofing materials. Asphalt shingles, sheet metal, tar and cement, clay tiles – these are just a few of the choices that homeowners and business owners have. However, one option stands out from the rest – liquid rubber roofing. It can be installed at a residence or on a business, and it offers quite a few important benefits. We’ll take a closer look at six of those below. Liquid rubber roofing might not be made from natural rubber, but that does not mean that it isn’t a green roofing solution. Because it is made largely from recycled materials, it removes waste from landfills and helps to prevent pollution. It also helps reduce the need for air conditioning by controlling the temperature within the building better, thereby reducing your demand on the local power grid. 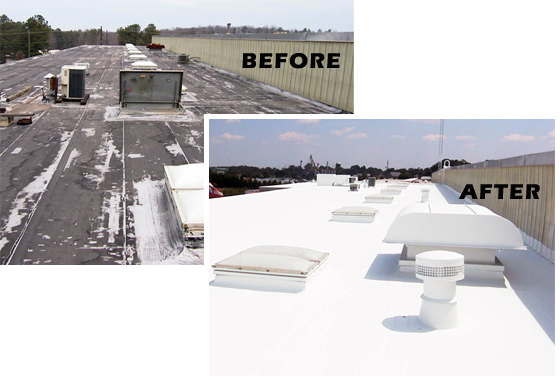 Another significant benefit of liquid rubber roofing is the reduced need for maintenance. With other types of roofing, even those vaunted metal roofs that can last up to 50 years, there’s a need to reseal periodically, or to replace damaged shingles and tiles. With rubber roofing, there is very little need for anything but the occasional recoating of the roof with a single layer of new rubber. Liquid rubber roofing requires less time for installation than traditional asphalt shingles, or sheet metal, and drastically less time than clay or slate. The material can simply be poured onto a flat roof and then rolled out. On other roofs, it can be sprayed on for even faster application. Not only does that save a dramatic amount of time, but it reduces costs associated with labor, too. The weakest points on any roof are the seams where materials are joined together. These are the most common sources of leaks, and the most likely point of failure in high winds. With liquid rubber roofing, there are no seams to worry about. The material is sprayed or rolled on, and then it self-levels, creating a single, seamless membrane (called a monolithic membrane). With no seams to fail, you have fewer worries about leaks or storm-related damage. VOCs, or volatile organic compounds, are found in a wide range of things, from new carpeting to furniture to roofing materials. These can create serious health problems, including asthma and COPD. However, liquid rubber roofing formulations contain low or no VOCs, dramatically reducing the potential for odors and unwanted health issues with family members or employees. Finally, liquid rubber roofing is completely waterproof, and it is from the second it is applied. Unlike other like roofing materials, EPDM-based roofing material repels water naturally and does not need to wait for curing to be waterproof. This is a boon for installers, homeowners and business owners, as it means that an unexpected storm during application doesn’t mean disaster. However, note that this material does require time to cure. It will take several hours to dry to the touch, up to two days to dry to the point it can be walked on, and up to seven days to cure completely. As you can see from the information above, there are many benefits associated with EPDM liquid rubber roofing. Affordable, easy to install, durable, environmentally friendly and inherently waterproof, it is one of the best choices available for homes and businesses alike. Posted on June 14, 2018 by Greg Kaz. Do you want to have some added protection on your roof? If you have a flat or a low-sloped roof for your home or your business, as is often the case with commercial properties, the last thing you want to deal with is a leak. You could have damage to the structure of the building, as well as your belongings in the building if the leak were to become a big problem. The best thing to do is to add some protection to your roof before these problems get out of hand. The best and simplest way for you to do this is to use Liquid Rubber for the roof. When it comes to applying the roofing material, you will find that you have several choices available to you. It is often possible to utilize a sprayer, just as you would with paint. This can be a great option for those who happen to have a large roof that they need to add the coating to as quickly as possible. However, it is not the only way that you can apply the Liquid EPDM Rubber roof. You can also apply it manually with rollers and even paintbrushes around tight areas, just as you would with regular paint. Before you get started, you will need to make sure the roof has been prepared properly, and that you have all of the right tools. You need to clean the roof to remove all of the dirt and debris. After all, you do not want to seal in any grit, dirt, or other elements that will cause an issue with the adherence of the coating. While there may be some cases where you feel that you need to add multiple coats, you will find that most of the time, all you are going to need is a single coat of this product. It will provide you with the coverage you need, and you will not needlessly add weight to the roof. This also tends to mean that it is fast to complete the roofing project since you won’t have to wait for a coat to dry and cure before adding another one. Do You Need to Work With a Professional? One of the concerns that many people have when it comes to their Liquid Rubber roof is whether they can really take care of the installation all on their own, or if they need to have some help from the professionals. Be assured that if you have the time and the tools, and you take the time to follow the manufacturer’s instructions, along with some simple safety measures, you can do it on your own. It takes some time, but it is certainly possible, and that is the route that many people choose to take. However, if you find that you do not have the time or the inclination to do this on your own, you can always hire someone to take care of it for you. If you want to save some money though, complete it on your own. 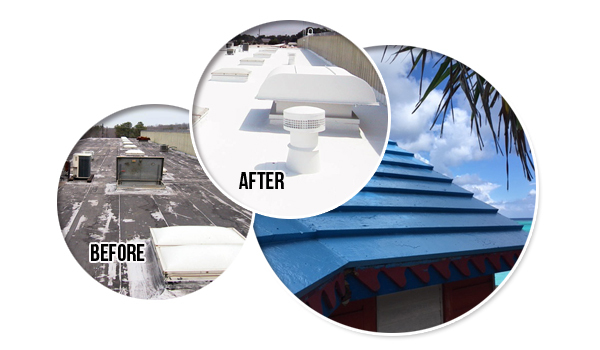 You will find some great benefits when you choose to add this product to your roof in addition to just protecting from the rain. You can also help to control the temperature in the building. If you live in an area where it is hot, you will want to use white to reflect the sun and keep it cooler in the building. Those who live in areas where it snows might want to use black, which can absorb the heat and make it cooler in the hot weather. 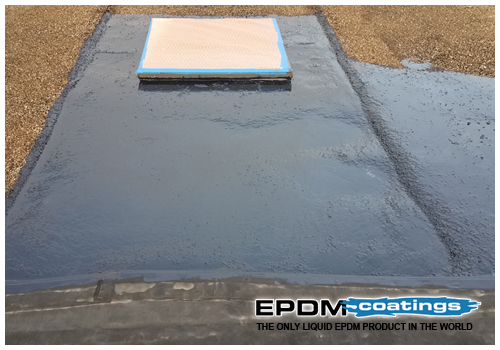 Use Liquid EPDM Rubber roof coatings and see just how much better they can make your roof. Why Should You Consider EPDM Rubber Coatings? Posted on May 9, 2018 by Greg Kaz. Do you have a flat or a low-sloped roof that is going to need some protection? You always want to make sure that your roof has plenty of protection to ensure you do not have leaks that could damage the building, or the goods kept inside of the building. However, you may not know what type of roofing material should be used. One of the best options would be EPDM rubber coatings. They have some great benefits, and they are very versatile. Let’s look at some of the best reasons to consider using this type of roofing for your building. There are a couple of options available when it comes to EPDM rubber coatings. The membranes have been around for a long time, and they have all of the benefits of the liquid coating, which we will discuss later. However, there are some potential issues with the membranes. Namely, they are going to be more difficult to install, and you will not likely be able to do it on your own. In addition, the membranes are going to have seams between the sheets. If there is an issue with the seams, it means that water is still going to get to your roof and that it can still potentially cause damage to your roof. This is the last thing that you need. If you were to use the membranes, you would want to make sure that you only entrust the installation to a professional. However, if you were to choose the EPDM rubber coatings made from liquid, then it is easy to apply it on your own. This can help you to save some money, and it has some added advantages over the membranes. Since it is a liquid, it means you are not going to need to worry about seams. This is a seamless product, and that means there is no chance for water to slip in between the membranes and cause damage. As long as you take the time to prepare and clean the roof properly, it is going to work out quite well for you. This will provide a proper seal, and it will go on just like paint. In some cases, such as with a large roof, you might want to consider using a sprayer for the application. 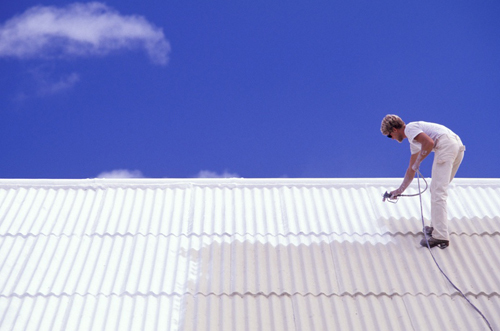 However, many just use rollers and brushes to apply the coating to their roof. Once you put the EPDM rubber coating onto the roof, it will be waterproof immediately. This is true even if it has not cured fully. If it rains just a few hours after you apply the roofing, you are still going to be protected, which is certainly nice. The coatings offer some other great benefits, as well. They are very durable, which is fantastic. The coatings are puncture resistant, and with just some basic maintenance, they can last for decades. In addition, the product is flexible, this means that it is not going to crack or split when there are temperature extremes. From 300 degrees F all the way down to -40 degrees F, you will find that these coatings are going to work well. While it is true that you do have quite a few options when it comes to roofing for your business, you will find that the EPDM roof coatings tend to be one of the best choices you can get. It offers some great benefits, and it is a product that can truly be trusted. Posted on June 8, 2017 by Greg Kaz. Has your roof taken some damage? Are you able to tell because it’s leaking? If so, don’t worry. As you’re about to see, Liquid EPDM Rubber is perfect for solving that problem. The moment a leak happens, most people immediately think about the small fortune they’re going to need to spend in order to fix it. Sure, you want to repair roof leaks immediately, but it can still be an extremely aggravating to imagine the price it’s going to cost. Fortunately, EPDM is probably the most affordable way to repair roof leaks. It’s largely made from recycled materials for one thing, so along with being environmentally friendly, it’s also very budget-friendly, too. This goes along with our last point. Obviously, a lot of the reason many home repairs cost so much is that you’re paying for labor, which can quickly add up. We already told you it was affordable, but this also relates to how easy it is to apply. EPDM can repair roof leaks in no time. So whether you’re doing it yourself or hiring a professional, your bank account will hardly know. You’ve probably heard horror stories about people who repaired a roof leak only to find out the job wasn’t complete the next time it rained. Aside from the obvious problem, this means more time and money doing it all over again. 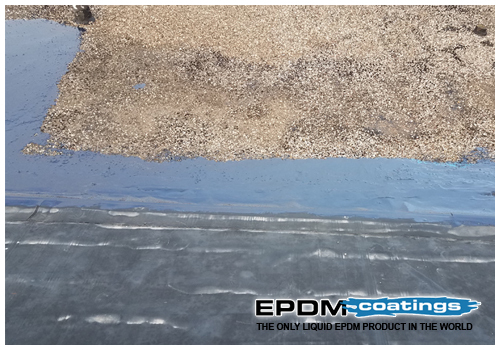 If you want to avoid this common issue when it’s time to repair roof leaks, use EPDM for the job. EPDM is extremely durable. Studies have been done on roofs treated with this amazing material and even after 10, 20 or 30 years, it’s working as well as it did the first day it was applied. Another problem with repairing roof leaks is that you absolutely must choose the right material for the job. Amongst other things, this entails considering the climate in which the home is located. Down south, the blistering sun can make quick work of a lesser material. Up north, the winter cold and constant snow can beat on a roofing material until it finally gives way. EPDM has been tested in the most extreme climates and doesn’t budge. While it cures best in temperatures of 55 degrees or above, it will still work in colder temperatures; you’ll just need to wait a bit longer. Finally, another issue you’ll run into with some liquid roof repair products is that you can only apply it to a horizontal surface. This is not the case with EPDM. The liquid can be used on damage to horizontal or vertical sides of your roof. Again, because it cures so quickly, you don’t have to worry about it spilling off before setting. Hopefully, these five reasons have made it clear that Liquid EPDM Rubber is the best option to repair roof leaks no matter where they occur. Don’t take any chances when your roof is damaged; use Liquid EPDM Rubber.